ECE graduate student Yongqiang Wang received the INFORMS Computing Society (ICS) Student Paper Award 2010 for the paper "A New Stochastic Derivative Estimator for Discontinuous Payoff Functions with Application to Financial Derivatives.” His award was presented during the INFORMS Annual Meeting in Austin, Texas, from November 7th to November 10th, 2010. Wang is currently a Ph. D. candidate in the Electrical and Computer Engineering Department and received his B.E. and M.S. degrees at Zhejiang University in Hangzhou, China. His advisors here are Michael C. Fu and Steven I. Marcus. ICS is INFORMS' leading edge for computation and technology. 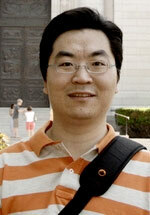 Major ICS interests include algorithms and software for modeling, optimization, and simulation. ICS is also interested in the leading edge of computing and how it affects OR.